This page contains topics for the new GSP owner to consider. 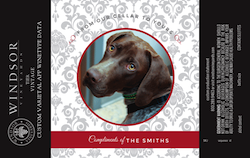 If you are adopting a GSP from us, you will also receive our Adoption Packet. Petfinder has a number of resources on their site for new adopters and people considering adoption. Included is an extensive video library on a variety of topics, as well as a book geared for new adopters: The Adopted Dog Bible. You’ve welcomed (or are about to welcome) the newest member of your family! Congratulations! We hope you have a long and happy life together. Here is some information about pet insurance. We strongly recommend that you purchase a pet insurance plan, or set up a monthly savings plan to cover both routine and emergency veterinary needs for your new best friend. Some people may be able to pay the bills as they arise, but most people can benefit from the coverage and peace of mind that a pet insurance plan can offer. Not all pet insurance is the same. It pays to do your research. Consider more than price. Usually, the lower the price, the less coverage. Claims are allowed from any licensed vet. You pay the bill, then submit your claim (it’s different than human health insurance). Pet insurance protects you from large unexpected vet bills. Do premiums increase with the age of the dog? Are all ages accepted? Are GSPs covered? Any breed-related conditions not covered? Does the policy cover accident, illness, routine care? All three? What are the deductibles? Are there co-pays? 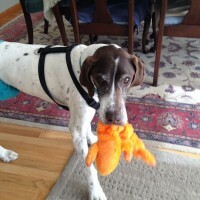 Pet insurance can help you, the loving adopter, take care of your new GSP! We do not believe it is our role to give you specific recommendations on which brands to feed. That said, we do believe in feeding a high-quality diet to help keep your dog fit and healthy, whether you prepare everything yourself, purchase commercially available foods, or use a combination. Since products and formulations change over time, and the needs of your dog may change over time, it can be helpful to periodically re-evaluate your dog’s food. Other factors to take into consideration when making your pet food and treat purchases include corporate ethics, food recalls, and animal testing. If you don’t already have a vet, you’ll want to find one, preferably before you adopt your new best friend. 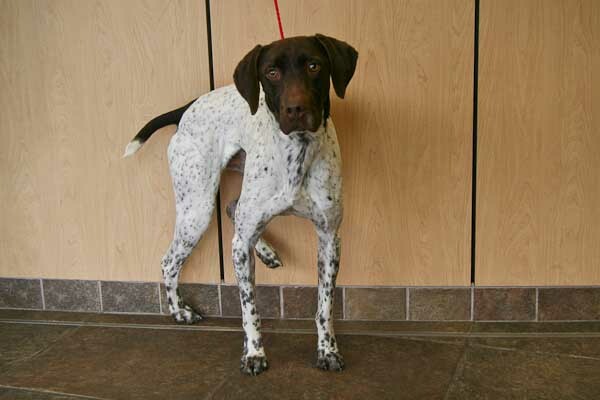 You’ll want to take your GSP in for a check-up within 7 working days of adoption. Ask people you trust for referrals, and ask both what they like about their vet, and if they have any complaints about their vet. You are your dog’s advocate. 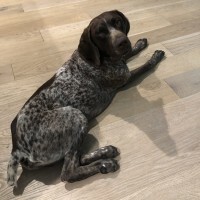 Be sure that you select a vet that you feel comfortable with and are able to communicate with, that will work with you in a partnership to provide what is best for you and your GSP. Consider purchasing Speaking for Spot, and Your Dog’s Best Health: A Dozen Reasonable Things to Expect from Your Vet, by Dr. Nancy Kay. Learn to become the ultimate advocate for your pet’s health. These books cover such topics as how to select a vet, questions to ask, the 10 Commandments of Veterinary Visits, and reasonable expectations for both your vet and you! Vet care is no longer just about vaccinations. The annual visit with your veterinarian focuses on wellness and preventative care. The Canine Preventative Healthcare Guidelines are now available from the American Animal Hospital Association and the American Veterinary Medical Association. Pet Rescue Rx is a new concept in pet medications. Competitive pricing for you and a donation of 100% of the net profits of your order for our foster dogs. Outstanding customer service. Pet Rescue Rx carries the exact same FDA and EPA approved pet meds that your local veterinarian does but at significant savings for you. All leading brands including Frontline Plus, K9 Advantix II, Advantage II, Dasuquin, Greenies and Heartgard. All prescription medications require approval by your veterinarian and Pet Rescue Rx pharmacists will call your veterinarian for you to verify the order. 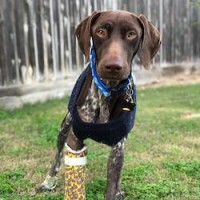 Please select NorCal GSP Rescue during the check out process. Yes, please! Training is a great way to form a strong bond with your GSP. Your trainer will also assist you in the adjustment process as you get your new family member settled. 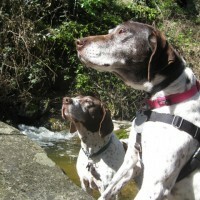 If you are adopting an adult GSP, be assured that dogs of any age can learn and will benefit from training. See more information about training and trainers on our GSP Training and Info page. Good dog! At some point, you may need to board your GSP. It’s best if you’ve planned in advance and selected a provider so you’ll know your GSP is safe and secure while you’re away. Common boarding options include kennels, cage-free boarding, and pet sitters. Which one is right for you, and how do you go about evaluating the choices, the options, and the providers? Here’s a great article written by our founder that lays it all out for you. Final hint: don’t wait until the last minute to make your decisions and try to get a reservation! So many things to know and keep track of, but here’s a handy set of information from the ASPCA – get familiar with foods, poisons, plants and more that can be dangerous for your pets. You might also want to enter this ASPCA phone number into your phone or address book, or post it on your fridge/bulletin board: Got a Poison Emergency? Call (888) 426-4435. If you think that your pet may have ingested a potentially poisonous substance, call (888) 426-4435. A $65 consultation fee may be applied to your credit card. 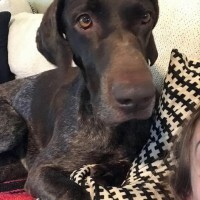 Lost dogs can’t call home, so NorCal GSP Rescue has partnered with Whistle, a GPS Tracker for pets, that lets you monitor your dog’s location at any time of day. Use this link and get $15 off with the promo code SHELTERLOVE. Whistle’s device attaches to your dog’s collar and tracks movements throughout the day so you know what s/he is doing when you’re not around. 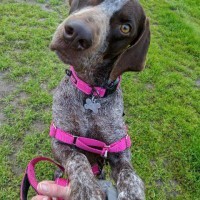 NorCal GSP Rescue receives 50% of each sale. Did you know that a microchip is not a GPS tracker? All of NorCal GSP Rescue’s dogs receive a microchip prior to adoption, in case a dog’s collar or tags are lost. But many adopters prefer additional means of tracking their best friend – if that’s you, check out what Whistle has to offer. There are many articles available in print and online about disaster preparedness. We found this blog post by Dr. Nancy Kay to be quite comprehensive, and outlines everything you should consider as you put together your plan for your pet. I wanted to remind everyone what it’s like during middle-of-the-night emergencies. Some tips that helped us: keep leashes/harnesses in the same place every night so even in the dark, you know where to get them. Might keep a flashlight there too! Leash your pup right away — even if they run off, it’ll be clear that they are lost and need help. WATCH OUT FOR BROKEN GLASS! it was everywhere, and prevented us from using at least one exit (others were wedged shut). Also, WATCH OUT for other dogs. If you have an extra leash, walk out the door with it. Our neighbor’s dog nearly attacked us and neighbor did not have a leash! And lastly, we weren’t prepared for the endless stream of PG&E workers, city inspectors, contractors – these might frighten your pup and s/he could take off. 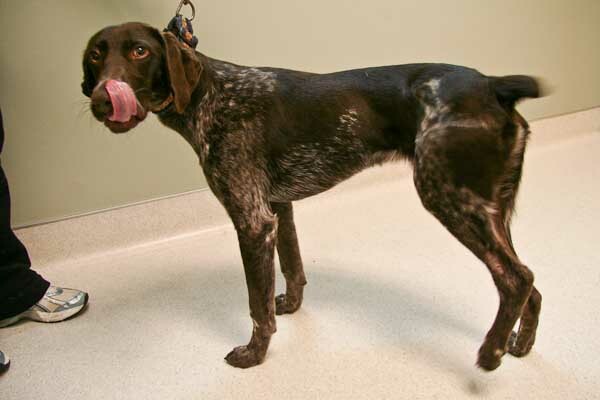 What Will Happen To My GSP If I Die? Preparation of a will or trust should be thought of as a caring gift to someone you love. But what if that “special someone” is your family pet? In the course of estate planning, people are often concerned about what will happen to their pets when they die. Everyone is encouraged to prepare either a will or a trust as part of basic estate planning. It is a simple matter for pet owners to designate in their will someone to take care of their pets as well as a tidy sum to be reserved for the pet’s expenses (food, vet bills, toys, etc.). A surprising number of people ask whether they can leave money for the care of their companion animals. The answer is a resounding “Yes!” California law now provides for animal trusts that can actually be enforced. Animal trusts are no longer “honorary,” depending only on the honesty of the animal’s custodian. You can leave money for a particular animal and be certain that the terms of the trust, as established by you, will be carried out. You can designate that the money be used for feeding, veterinary bills, maintenance, and any other aspects of the animal’s care. For example, does your dog require prescription dog food? Trust funds can be used to pay for the special food. You can also appoint a successor custodian to take care of the animal if the designated person can no longer care for the animal. Under the California Probate Code, a trust for the care of an animal is a valid trust that can be enforced in court. An action to enforce a pet trust can be brought by “any person interested in the welfare of the animal.” This includes animal-care organizations such as the SPCA and similar non-profits that have as their principal activity the care of animals. In addition, the settlor (person creating the trust) may designate certain persons who will have the right to bring a court action to enforce the trust. If no one has been designated in the trust instrument, the court can even appoint a person to enforce the trust. Generally, regular accountings are required, and copies must be given to any nonprofit charitable organization (such as the SPCA) that has as its principal activity the care of animals and that has requested these accountings in writing. These and other protections were put in place by the State Legislature to protect against fraud and abuse with funds that were intended to provide for much-loved companion animals. For example, a remainder beneficiary (a person who is designated to receive funds remaining upon the animal’s death), an enforcer named in the trust, and animal-care organizations all have the right to check on the animal, inspect the animal’s living situation, and review the financial records of the trust. The Probate Code mandates that trust income and principal may not be used for any purpose other than the benefit of the animal. In certain situations, you may want to include a special clause in your will or trust to protect the animal(s) from being used for research or testing. 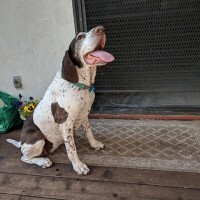 You may want to leave a portion of the estate to the SPCA or another animal protection organization, such as NorCal GSP Rescue. A living trust provides all the benefits of a will and none of the drawbacks, and can also be used to ensure your pet will be well cared for. The pet’s trust can be inserted right into your living trust. For people who love their companion animals, the provisions governing pet trusts are an exciting and welcome addition to our Probate Code. If you are interested in making a donation to NorCal GSP Rescue in your Will or Trust of at least $10,000, Attorney Malkin will prepare your Will or Trust at no charge.